Address by the Prime Minister Rt. Hon. Keith J. Holyoake, C.H. A streaming take-off of four RAAF Mirages. Streaming take-off by two USAF McDonnell Douglas F-4 Phantoms. Formation aerobatic display by four RNZAF Vampires. 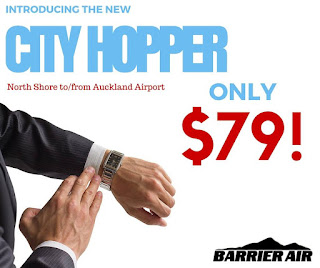 Barrier Air are to replace Air New Zealand services between Auckland and Hamilton. 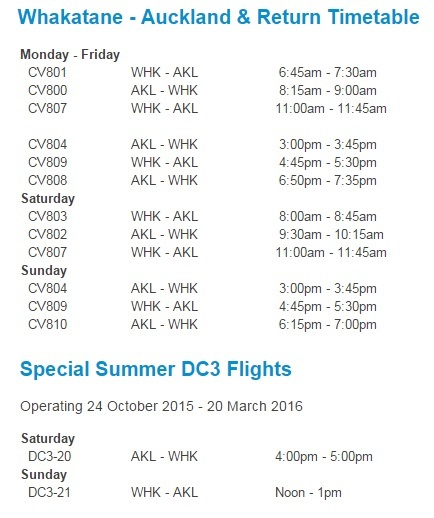 Air New Zealand's last flight will operate on the 8th of February 2016 and Barrier Air will commence operations on the route the following day. 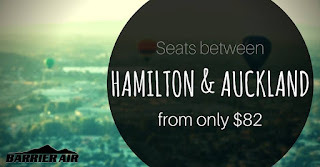 Flights start at $82 per seat. Photographed at Woodbourne on 23 January 2016 was Fokker Friendship ZK-NAN that was noted being moved from it's usual spot down on the military ramp to up by Rescue Fire Section. Happier days... Above, Fokker Friendship ZK-NAN while with Air New Zealand at Oamaru on 20 March 1989 and below at Oamaru again with NZ Post on 1 October 1995. Ahead of Sunair's launch of services from North Shore to Hamilton, Tauranga and Rotorua next month the company has added Piper Navajo ZK-JGA to its fleet. Sunair have previously operated one another Navajo, ZK-FIL and a larger Piper Chieftain, ZK-KAP. Sad news from Christchurch today with the passing away of Ron Killick over the weekend. Ron was a founding member of the AHSNZ and in the past he took a lot of aircraft photos but he was particularly noted for his recording of international air movements when the only way to record them was by monitoring the HF radios. Kiwi Air has its sights on Taupo with a test flight next week set to gauge interest in the route. Taupo air travellers sighed in relief when their council signed a six-year deal with Sounds Air last year. The success of the Marlborough based airline, which filled the Taupo-Wellington route abandoned by Air New Zealand, along with Taupo's growth, is now being closely watched by another air operator- Hamilon-based Kiwi Regional Airlines. Kiwi Regional Airlines chief executive Ewan Wilson said nothing has been "set in concrete" but the Hamilton based-airline has been in talks with the Taupo Airport about providing Taupo flights. It already flies between Hamilton, Dunedin, Nelson, and Tauranga. Next Wednesday the airline will be breaking into its regular Dunedin-Nelson-Hamilton scheduled service to run it's first charter by whisking American rock legends Huey Lewis & The News into Taupo for the Summer Concert Tour. 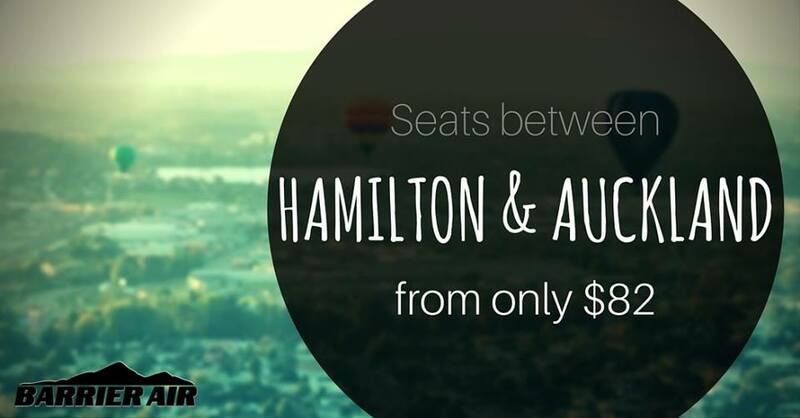 The airline is offering $29 seats from Taupo to Hamilton on the same day (12.45pm). Wilson said the charter would be used as a way of gauging the level of interest in providing more regular Taupo flights. "[We're] excited to be flying into Taupo for the first, and hopefully not the last time," he said. "We have often looked at Taupo and although we don't have any long-term plans set in concrete it is fair to say we are constantly reviewing and looking at how other airports fit with our future business model. Taupo is definitely on that list." He said the airline was not interested in going head to head with other providers. Taupo mayor David Trewavas said having more Taupo flights would bring more benefits to the region. "The airport is completely open to anyone as long as they meet aviation and the airport's requirements so it is very good news," he said. "Our regional growth is substantial at the moment and there has been a lot of interest from people wanting to visit so this could have a significant impact on tourism." Trewavas said the Sounds Air service, which provides at least three return flights each weekday and two return flight on Saturday and Sunday, had been well received. Despite the council agreeing to guarantee the first three seats on each flight it hadn't needed to. "Everyone that flies on it raves about it," he said. 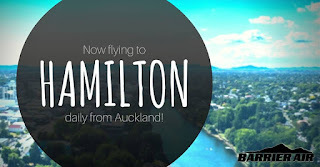 To book on the one-off flight visit flykiwiair.co.nz or phone 07 444 5020. Does anyone have any information on the last Mount Cook Airlines Hawker Siddeley 748 flight??? I have the date and route but I would appreciate any details of the aircraft and crew, and/or maybe a photo??? Also, I am still looking for a photo of an Air New Zealand Friendship at Westport. This is proving incredibly difficult! A great job apart from one faux pas!!! Meanwhile Originair has also been using Inflite Charter's Jetstream ZK-ECJ. Competition for regional flights has heated up at Tauranga Airport with a new airline set to fly the southern skies next month while figures from Air New Zealand show the city is one of its fastest growing ports. Kiwi Regional Airlines chief executive Ewan Wilson said the carrier would start operations on February 16 and target Nelson and Dunedin. Reservations opened a month ago and the initial response was positive, he said. "We are really encouraged by the response. There has been a real flourish of bookings." A 34-seater plane with two pilots and an air hostess would operate out of the city. A key part of growing tourism is easy access to our region. Airports and the airlines they service are critical to making it easy and affordable for visitors to fly to our region. 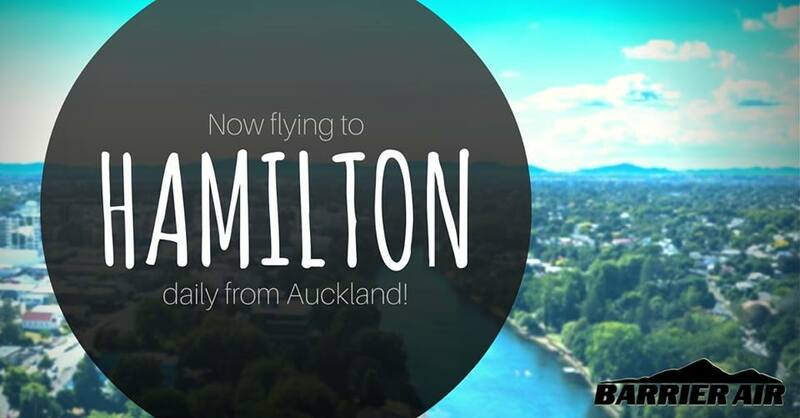 Tourism Bay of Plenty head of marketing Kristin Dunn On October 27 last year it started flying out of Hamilton to the same destinations, he said. "I am absolutely thrilled to be adding Tauranga to our network, it's part of the golden triangle when it comes to economic hubs. It's really exciting." Sunair Aviation was likely to provide ground handling and other services, Mr Wilson said, and it would hire a check-in counter at the airport. Air New Zealand group communications consultant Kelly Kilgour said the outlook for the region was very positive and it was set to increase seat numbers and upgrade aircraft. "We are continuing to see strong demand for services to and from Tauranga. We are working closely with regional stakeholders and continually reviewing options to ensure we are offering the right services for the community." In 2015 it operated 375,000 seats in and out of Tauranga - a jump of 5 per cent compared to 2014. "We expect this growth to continue with a 7 per cent increase in seat capacity forecast by the end of 2016." Air New Zealand operates three Tauranga routes including Auckland, Wellington and Christchurch with each of them increasing in capacity in 2016. It was replacing its 19-seat Beech 1900D operated services to Auckland with a 50-seat Q300 aircraft while the Wellington route capacity would jump by 24 per cent and Christchurch by 38 per cent, she said. Sunair Aviation chief executive Dan Power said it had been growing steadily year on year. Due to demand it was going to start flying to the North Shore and back on February 1, for five days a week. "We are very excited to be able to offer this service as an alternative Auckland destination for our Bay of Plenty residents." A Jetstar spokesperson said it had no plans to add further cities to its network after Tauranga lost a bid for its flights in 2015. Tourism Bay of Plenty head of marketing Kristin Dunn said value and choice were important for visitors, so increased competition "is a real positive". "A key part of growing tourism is easy access to our region. Airports and the airlines they service are critical to making it easy and affordable for visitors to fly to our region." Tauranga Airport would also receive a $4.5 million upgrade later this year to make space for the increasing number of passengers flying in and out. Manager Ray Dumble said the introduction of the new airline and developments at the airport was great news. Cessna 180 ZK-CDY at Raglan on 17 January 2016... the last time I saw this Cessna was in 1985 - and it was orange! Waiting for its departure to Wellington was Sounds Air's Pilatus PC12 ZK-PLT. I do like the scheme! Barrier Air has announced that it will offer City Hopper flights between North Shore Airport at Dairy Flat and Auckland International from 1 February 2016. As the Barrier Air's Facebook page explains, "Why waste precious time in traffic, pay for parking, or even worse pay over $100 for a taxi??" Two return flights will be operated on weekdays as follows. Today marks the 10th anniversary of our first flight from Takaka to Wellington. On 12 January 2006 we started for a few months in summer with four flights a week, using instructors from the Wellington Aero Club and one aircraft - ZK-ZIG. On that first flight the pilot (Chief Instructor Dan Howe) arrived in Takaka at 5.20 pm in deteriorating weather conditions and immediatly announced he wasn't returning (much to the shock of our waiting three passengers - one was Richard's mum!) Dan slept on our lounge floor for the next two nights while we waited for the weather to clear and we shuttled our passengers back and forth to flights from Nelson! Thanks to all our amazing pilots over the years, and a very special thanks to everyone who has supported our service over the last decade. It has been a privilege to be part of such a wonderfully diverse, creative and caring community in beautiful Golden Bay. We are certainly looking forward to the years to come! Piper PA31 Chieftain ZK-VIP arriving at North Shore from Great Barrier. while Barrier Air's newest Piper PA31 Chieftain ZK-FOP was heading north to Kaitaia. Quick reminder to self... when you change the camera seating to sport to catch a jet on the runway remember to move settings back to TV - frozen props! Any regional or 3rd level airline that wants to survive in New Zealand really needs a niche market. One regional airline success story is Air Chathams which has grown from a fleet of one Cessna 337 in 1985 to a fleet of five Convairs, three Saabs, four Metroliners, a Rockwell Commander 690 and a Cessna 206 in 2018. 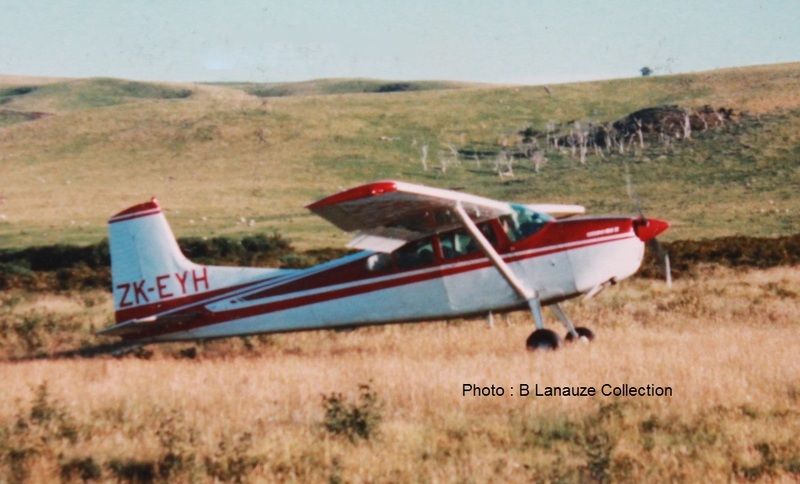 Craig Emeny's association with the Chatham Islands began in the early 1980s when he began flying crayfish between Pitt Island and Chatham Island for various fishing companies using Cessna 180K ZK-EYH (c/n 180-53011) which was based at an airstrip at Owenga. Craig Emeny's original Cessna 180 ZK-EYH at the strip at Owenga. Seeing the need for this air service to Pitt Island and for a more economic way to get the crayfish to mainland New Zealand Craig and Judy Emeny decided to form their own Chatham Island based operation and they purchased Air Rarotonga's Cessna 337F Super Skymaster, ZK-TAI (c/n 337-01456) in 1984. Initially the aircraft was operated under Napier-based East Air’s licence with crayfish and passengers being flown from the Chathams to the mainland. Most flights went to Gisborne but the 337 also flew to other mainland destinations as well as providing a regular link to smaller Pitt Island. The impact was immediate – the return on live crayfish increased from $6.80 per kg to $10.00 per kg! Cessna 337F ZK-TAI seen still sporting the same livery it flew in for Air Rarotonga photographed while on maintenance at Hastings on the 20th of February 1985. At this stage it was still operating on East Air's licence. In March 1985 Air Chathams was granted its own licence and began operating in its own right. On the 3rd of December 1986 disaster struck the young company when the nose wheel of ZK-TAI collapsed on Pitt Island's Waipaua strip. On board were the newly appointed Catholic Bishop of Christchurch and the local Catholic Parish Priest. No one was injured, though the bishop did sport a black eye which caused suitable comment on his return to the mainland. Within seven days the company had found a replacement aircraft in the form of Cessna P337G Super Skymaster II ZK-TSH (c/n P337-0252), which had previously been owned by the racing driver Chris Amon. TSH was a pressurised turbo charged model with a Robertson STOL kit, thus providing more speed and comfort on the flights to the mainland while being able to operate easily to Pitt Island. Air Chathams' freight service "to New Zealand" continued to grow rapidly and the company looked for a larger aircraft than the Cessna 337. This arrived in New Zealand in January 1988 in the form of a Beech 65-B80 Queen Air which was initially operated under its American registration, N640K (c/n LD-430). It was later placed on the New Zealand civil aircraft register as ZK-CIA. The Queen Air was used for flights to the mainland while the Cessna 337 was kept to maintain the service between Chatham and Pitt Islands. Above, the Beech Queen Air at Christchurch on 4 April 1988 still in her American registration, N640K. Below, the Queen Air has assumed her New Zealand identity, ZK-CIA. Photo taken at Christchurch on 23 April 1988. The Queen Air could carry nine passengers or one ton of freight. NZ Wings wrote a profile on Air Chathams in October 1996, and this spoke of the aircraft’s “cabin class comfort and capability.” Air charter freight operations remained the bread and butter work for the growing company. Passengers fitted in and around the freight operations but the plane was used for charter flights enabling Chatham Islanders to attend rugby matches, races, funerals and the likes easily without being constrained by the Safe Air schedule. In the article Craig Emeny described the impact of the Queen Air on the Chathams economy: “The biggest thing was the increase in crayfish prices, from $7 a kilo up to $50 in winter. We more than doubled the returns to the fishermen, and the cash flow quadrupled for the locals. The factories wanted to take shares in the company and control the airline, but I wanted to run an air transport operation only. That led to a lack of investment capital but a continuing trust. You must stick to your principles." Air Chathams was becoming a fast growing part of the island's economy. No sign of the Beech Queen Air's American registration, but marked as the purists like it, with a "ZK-", ZK-CIA at Nelson on 5 October 1991. Pitt Island’s Waipaua strip again proved problematic in 1988. On the 6th of September 1988 Cessna 337 ZK-TSH was caught by wind shear on take-off and ran into scrub and fern, badly damaging a wing and twisting the fuselage. Sadly, since then, ZK-TAI has been scrapped. It would have made a wonderful addition to the development of the Chathams Island's aviation museum given it was the first of Air Chathams' aircraft. With Cessna 337 ZK-TSH's written-off Air Chathams had need for a new aircraft to service the on-demand Pitt Island flights. The Pitt Island service had established itself as an important passenger and freight link to Pitt Island as well as being important for the freighting of fish from Pitt to the Tuuta airport on Chatham for connecting flights to the mainland. The Pitt Island plane was also extremely useful for off shore search and rescue work as well as sightseeing flights. 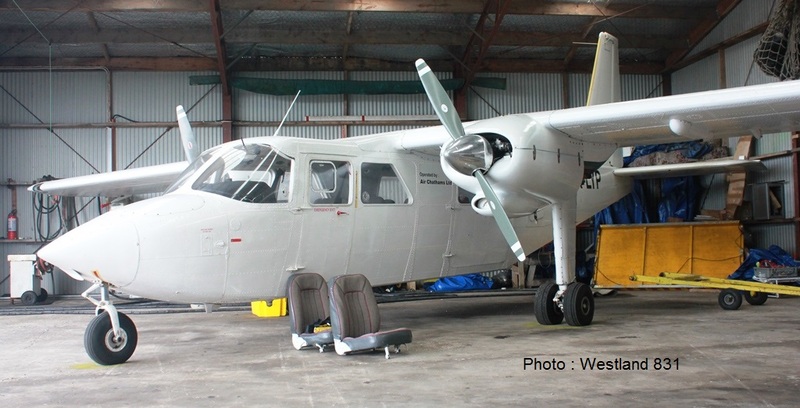 The replacement aircraft came in the form of Cessna U206F Stationair ZK-DOA (c/n U206-02203) which was registered to Air Chathams on 8 September 1989. Despite a rather unfortunate registration it proved to be a faithful workhorse for many years. The aircraft was also useful in emergency situations. In 1996 local doctor was flown to Pitt in atrocious conditions in the Cessna after a paua diver experienced a shark attack suffering deep bites on his back, arms and neck, losing a great deal of blood. The patient was flown back to Chatham before being transferred to the mainland in Air Chathams’ Metroliner ZK-CIC. Cessna 206 ZK-DOA on Pitt Island in April 1996. The following series of photos sent to me by Dave Paull of the NZ Civil Aviation blog (http://www.nzcivair.blogspot.com/) give a great example of the Pitt Island operation, though they don't do ZK-DOA justice her covered he anti corrosion paint... The photos were taken on Chatham on the 18th of October 1997. Preparing for a flight to Pitt with empty plastic tubs for fish on the return flight..
A mix of passenger(s), freight and empty fish containers taxiing for the flight to Pitt.. 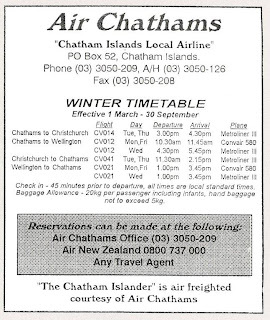 Safe Air had connected the Chathams to New Zealand for many years but in September 1990 the company closed its airline division and withdrew its Argosy aircraft. Air Chathams took this opportunity to expand its operation and the Beech Queen Air was replaced by a 15-seat turboprop Beech 99 (c/n U-68), ZK-CIB, which arrived in August 1991. With the introduction of the Beech 199 Air Chathams began scheduled services in competition with Mount Cook Airline who had been selected to operate Safe Air's replacement air service. With a price tag of $1.2 million dollars, the purchase of the Beech 99 was a big investment for the company. The Beech marked a big step up for Air Chathams and it was this aircraft that established the shape of Air Chathams as an airline. The turbo prop was faster than Mount Cook's 748s and could carry about one and a half ton of freight or up to 15 passengers on the service to New Zealand. 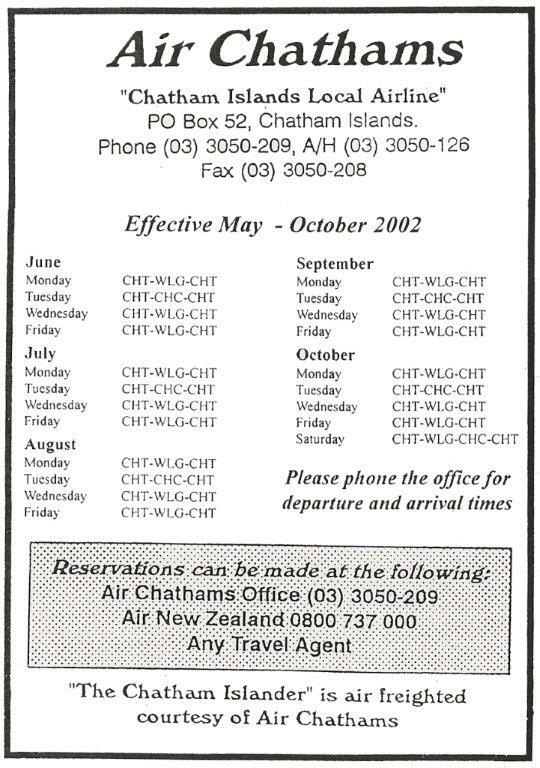 In October 1991 Air Chathams began a twice weekly scheduled service to Wellington and a weekly service to Napier with other non-scheduled freight flights operated as required. Air Chathams' Beech 99, ZK-CIB, at Napier on 21 January 1992. 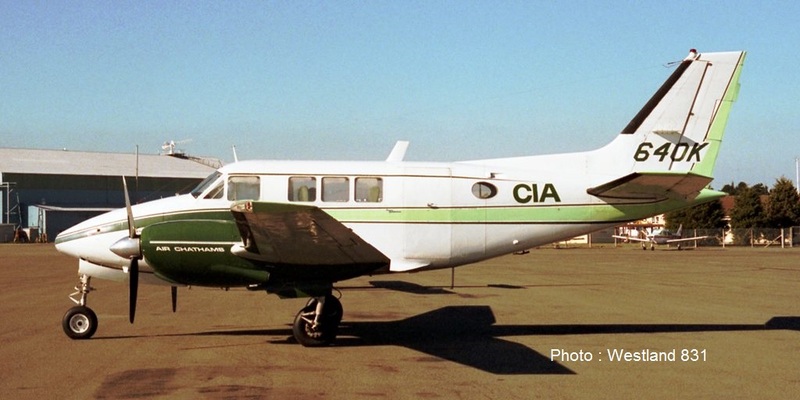 Meanwhile, the Beech Queen Air ZK-CIA found no work and it was eventually flown to Bridge Pa Airport at Hastings where it languished and grew moss for many years until it was sold to a local farmer in 2014. The Beech 99 proved to be a great success and passenger and freight traffic grew despite fierce competition from Mount Cook Airline. In September 1993 Air Chatham added Fairchild SA227-AC Metroliner III ZK-CIC (c/n AC623B) to its fleet. At the same time the company introduced a more comprehensive schedule to the mainland with twice weekly flights from the Chathams to Christchurch and three or four flights to Wellington, one of these also including Napier. Flying at 250 knots with a capacity of 17 cubic metres and equipped with a rear-loading cargo door measuring 1.3 metres, the Metroliner was an ideal combi aircraft, being used to transport one tonne of freight with 11 passengers or in an all-cargo configuration carrying two tonnes. In early 1994, after the arrival of the Metroliner, the Beech 99 ZK-CIB was sold and exported back to the USA as N900AR. Like Air Chathams', Mount Cook Airline's Hawker Siddeley 748 air service was not subsidised. This led to a fierce air war between the two airlines to gain a greater share in the marketplace. A discounting battle ensued resulting in bigger losses for both companies. 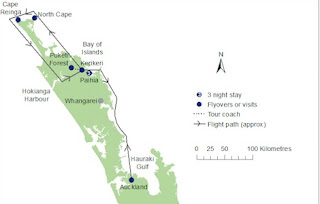 In late 1995 changes were announced for changes to air services to the Chatham Islands. Air Chathams announced they were intending to purchase a Convair 580 which was slightly larger and certainly more suitable than the Hawker Siddeleys while Mount Cook Airlines announced that the ATR 72-210 had been selected as the replacement for their Hawker Siddeley 748 fleet. A bigger change was to come, however, when quite unexpectedly Mount Cook Airline announced an end to its scheduled flights to the Chatham Islands from the 29th of January 1996. Mount Cook officials said freight and passenger numbers had not met expectations and were at a level that would not be economic if ATR 72s were used. Craig Emeny, owner of Air Chathams, was later to say of their advantage over Mount Cook was "that we're operating from the Chathams... We're based here, we live on the island and our priority and focus are for the Chathams." With the withdrawal of the Mount Cook Service Air Chathams became the sole operator to the Chatham Islands and with the Convair not yet delivered flights were maintained using Metroliner ZK-CIC. With Mount Cook gone the future looked bright for Air Chathams but on the 17th of February 1996, the Civil Aviation Authority grounded the company after a supposedly normal inspection the previous month. In grounding Air Chathams the CAA raised questions about the pilots’ Metroliner ratings and whether the pilots were properly trained or checked. The CAA also questioned whether the check pilot was appropriately licensed and expressed doubts about the prescribed safety standards, practices and training being recorded correctly. 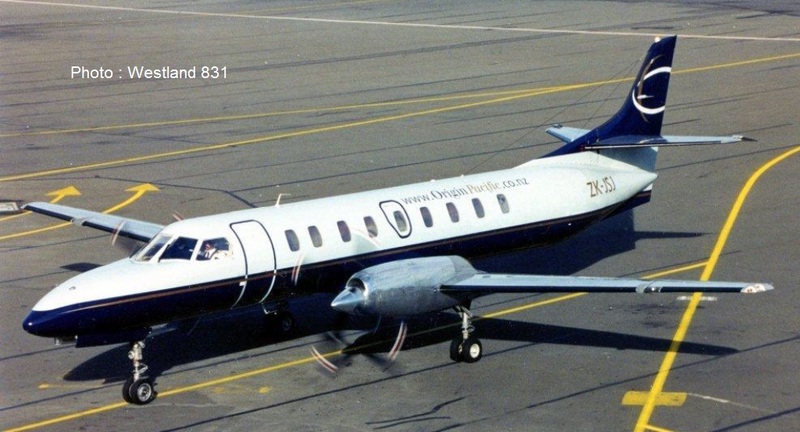 Suddenly the Chathams was without any air service and while Air Chathams challenged the grounding in the High Court, the company chartered Airwork’s Metros ZK-NSS and ZK-POA to maintain an interim service. Despite this interim air service the grounding had a serious effect on the Chatham Islands economy with the local Fishermen’s Association describing the grounding as "bureaucratic heavy-handedness" with the partial replacement service leading to a backlog of fish to be air freighted at the height of the fishing season. Heavy in the tail... Metroliner ZK-CIC fuelled and loaded starts at Christchurch for the long haul to the Chathams on 11 November 1996. Eventually, following the High Court hearing, Air Nelson which had a large fleet of Metroliners was called upon to test Air Chathams’ seven pilots to determine whether CAA’s grounding was fair. The court also directed that Craig Emeny be replaced as Air Chathams’ chief pilot. The pilots were subjected to the normal Air Nelson ground school and to the "mother of all flight tests." 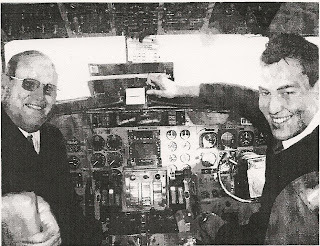 Air Chathams’ pilots passed with a well above average standard and this paved the way for the air service to be reinstated two months after the grounding. So was the grounding justified? The CAA was subjected to a Parliamentary Transport Select Committee hearing where questions of vested interests within the authority and an allegation of bias against Air Chathams were explored. The Committee felt that the CAA had not proven there was a safety issue with the company. NZ Wings' September 1996 edition reported that Air Chathams felt that the CAA had been unfair, obstructive and over-zealous in applying the rules, had falsely induced Air Chathams to sign its own suspension warrant and then actively prevented the airline from becoming operational again by removing its checking and training organisation. It named three CAA employees, one a previous employee of Air Chathams, who it maintained were particularly obstructive during the 55-day affair. It also said that the CAA's actions had created enormous financial difficulties for the airline. 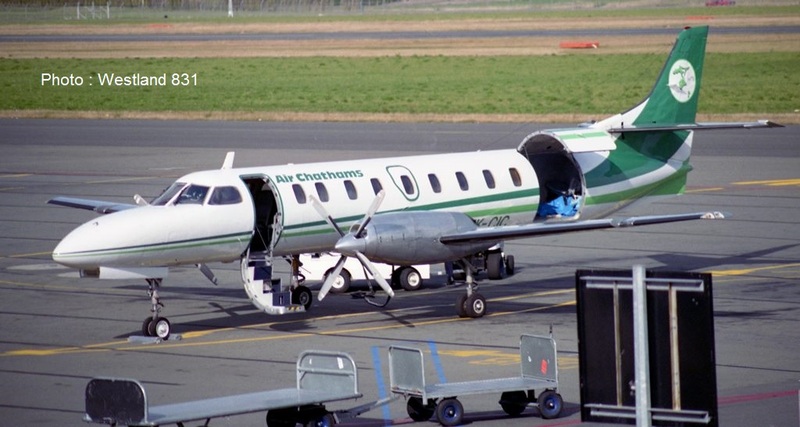 The CAA contested many of the Air Chathams claims and has stated that at the time of its investigations the airline was unsafe and was unable to demonstrate that it complied with the necessary safety requirements. It said that its investigations "showed serious safety deficiencies", and it "utterly rejected" the allegation that it had been obstructive in any way. The authority said that it "positively and proactively attempted to facilitate Air Chathams training which was a basis of the airline regaining its operational approvals." The October 1996 issue of NZ Wings published an excellent profile on Air Chathams where Craig Emeny reflected extensively on this difficult chapter in the company’s history, acknowledging that there were technical errors on both sides. While it caused the company all sorts of problems Air Chathams came out of it stronger and from my reading of the grounding Air Chathams was transformed from the operator that started with a Cessna 337 to become much better equipped to run the modern airline it is today operating with the highest standards in New Zealand. This and other groundings also caused a change in the CAA's culture as well. Certainly safety is what the CAA and any operator want! The grounding put the finance for the Convair in doubt. Air Chathams had lost close to $400,000 fighting Mt Cook Airlines and the grounding cost the company some $600,000. With assistance from the Chatham Island Enterprise Trust and Pitt Islanders and with the support of some of the fish processors on the mainland the company was able to put the finance together to complete the purchase. Air Chatham’s first General Dynamics Allison Convair 440/580, ZK-CIB (c/n 327A), began services to the Chathams on the 29th of July 1996 flying from Wellington to the Chathams with 13 passengers and 3 tonnes of freight and returning the next day with 5 tonnes of freight and 7 passengers. The Convair was configured as a combi meaning it could easily change from an all freight configuration with a total capacity of 6.3 tonnes, an all passenger configuration with a capacity for 39 passengers, and the normal mixed passenger/freight configuration with a capacity for 19 passengers and 4 tonnes or freight. The Convair’s large cargo door enables a palletised freight system similar to the cargons Safe Air used with Bristol Freighters and Argosies. Despite its age the Convair with its Allison turboprops give the aircraft a cruising speed of 285 knots at a normal operating altitude of 22,000 feet. It also offers the advantage of being able to carry a commercial payload to the Chathams of 5.1 tonnes eastbound and 6.1 back to New Zealand with all the refuelling being done on the mainland. A flight attendant is carried on all Convair passenger flights. ZK-CIB's cabin waiting for its passengers... Notice the absence of no overhead lockers... this means the rear bulkhead can easily be moved up and down the cabin as passenger and freight demands dictate. In the front right sealed plastic tubs of fish to be flown to the mainland. On the flight down to the Chathams on 15 April 2014 the Convair was in a full 39-seat passenger configuration - note the seats on the left hand side of the cargo door. The large door is ideal for this combi operation. Initially the Convair serviced Wellington three to four times a week and the Metroliner flew twice a week from Christchurch. The introduction of the Convair led to Napier being dropped from the schedule. Eventually all the services were operated by the Convair which was also available for charter work. Early examples included a plane load of Chatham Islanders flying to Auckland to see the Riverdance show, carrying Ansett passengers between Christchurch and Wellington while Ansett’s pilots were on strike and providing extra capacity for Air Freight’s night freight services. As time moved on Air Chathams had to look for new work for the Metroliner. In September 1997 the Southland Times announced that it was going to fly consignments of live lobsters between Invercargill and Christchurch. In late 1997 and 1998 it was used on contract with Ansett Air Freight and Air National while still being available to support the Convair during maintenance or breakdowns. Later Origin Pacific also used the Metroliner for both passenger and freight services. Above, Metroliner ZK-CIC at New Plymouth on 8 October 1999 while operating passenger services for Origin Pacific. Below, painted in full Origin Pacific colours, ZK-CIC at Christchurch awaiting take off clearance on runway 29 while on an Origin Pacific freight flight on 16 October 2000. After the collapse of CityJet in late 1999 Origin Pacific picked up their freight runs, the mainstay of which was the DHL contract. As Origin's business expanded they leased two Fairchild-Swearingen SA227DC Metro 23s to handle the growing demand and contracted Air Chathams to operate and crew these aircraft on passenger and freight services. Fairchild-Swearingen SA227DC Metro 23 ZK-JSV (c/n DC-868B) was registered to Air Chathams on 25 May 2000 and Fairchild-Swearingen SA227DC Metro 23, ZK-JSJ (c/n DC-888B), was also registered to Air Chathams on the 26th of June 2001. 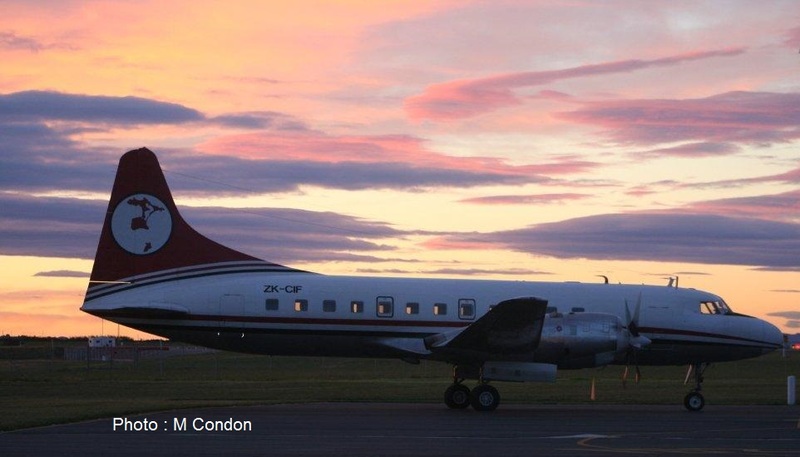 The two Metro 23s and Air Chathams' own Metroliner flew freight at night and passengers during the day, at one stage averaging 12 flying hours a day! Above, Metroliner 23, ZK-JSV, arrives at Christchurch on 23 October 2001 on an Origin Pacific freight flight. Below, ZK-JSV again on a freight flight this time in full Origin colours at Nelson on 15 February 2005. Metroliner 23 ZK-JSJ at Christchurch on 23 June 2001. 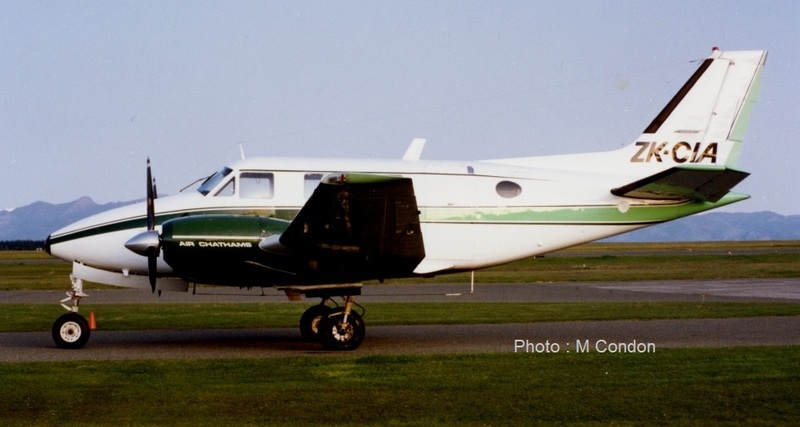 Air Chathams hit the news on the 18th of March 1999, when shortly before 5.00pm Cessna 206 ZK-DOA had a sudden engine failure north of Pitt Island. The pilot managed to get off a mayday call and to glide closer to shore before ditching in the sea. The plane filled with water and sank within seconds. The pilot, Steve Kihi and his four passengers safely escaped from the aircraft before swimming an hour to shore without the aid of life-jackets. Life-jackets were on board the aircraft but there was insufficient time for the pilot and passengers to locate them and put them on. By the time the five made shore Pitt Islanders were on hand to offer help and a fire was lit and tea brewed. The survivors were treated for cuts and bruises and two were treated for mild hypothermia. The aircraft was never recovered and the cause of the engine failure was not determined. ZK-DOA’s replacement was another Cessna U206G, ZK-KAI Stationair (c/n U206-03711). 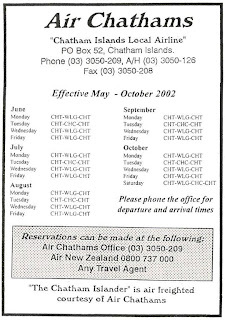 It was registered to Air Chathams on the 29th of June 1999 and it flew to the Chathams on the 1st of August 1999 and it continues to fly the Pitt service to this day. Boe Lanauze who has briefs the Air Chathams pilot on the Pitt Island weather as well as being the Pitt co-ordinator for flights. Air Chathams runs a couple of different types of service - on a charter basis for the whole plane or on a per seat basis when there are a number of people wanting to fly or there is freight to be carried. Boe and her late husband Ted have been servicing the Air Chathams' service to Pitt since it began. In January 2001 Air Chathams bought a second General Dynamics Allison Convair 440/580, ZK-KSA (c/n 507). KSA was originally an executive aircraft for General Motors but was subsequently bought by the King Solomon Hotel chain in the Solomon Islands. Based in Cairns it flew passengers to the chain's hotels in the Solomons and in Mt Hagen, Papua-New Guinea. It was initially envisaged that KSA would serve as a source of spare parts for ZK-CIB but its arrival was quite timely allowing CIB to undergo an eight month refit. Regular passengers noticed immediately how much quieter KSA was with its heavier sound-proofing. However, lacking the large cargo door, the loading of freight and luggage became a slow process which in turn played havoc with timetables. The all passenger Convair ZK-KSA about to line up on Wellington's Runway 16 on its flight to the Chathams on the 30th of March 2005. 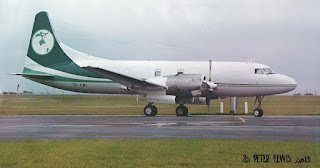 With CIB back in service KSA was leased to Pioneer Adventures for its New Zealand air tours while Air Chathams’ Metroliner ZK CIC was chartered to Origin Pacific. In January 2005 Air Chathams added a third General Dynamics Allison Convair 440/580 to its fleet. ZK-CID (c/n 385) was a pure freighter, was purchased from DHL in Bahrain. The intention was to convert the plane to a combi passenger/freight plane and use it on a Tonga to Niue service for Reef Air. It never saw service in the Pacific and was only used for a relatively short time used to operate additional freight services between Chathams and New Zealand before being placed in storage at Palmerston North where it languished for many years before finally being scrapped in 2014. With the prospect of services in the Pacific Air Chathams sourced two more General Dynamics Allison Convair 440/580s ZK-CIE (c/n 399) and ZK-CIF (c/n 381) and a simulator from Alaska later in 2005. Pacific operations began in May 2005 when Convair 580 went to Tonga in May 2005 to carry passengers and freight for Reef Air from Niue as well as being used by a Tongan airline, Peau Vava'u. With the arrival of the two Canadian Convairs ZK-KSA was sold to Pionair who operated it in Australia. Air Chathams now had a fleet of three Convairs, one working in New Zealand, one in Tonga and one in reserve. 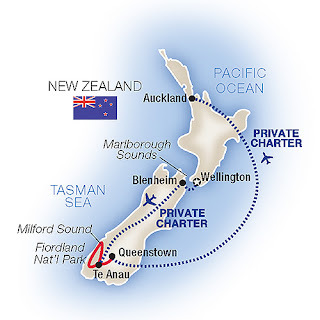 The larger fleet also enabled the company to introduce a Thursday flight between the Chatham Islands and Auckland. Convair 580 ZK-CIE was painted in Air Chathams' colours but never carried titles. It is seen here on the taxi at Christchurch for its flight to the Chathams on 29 August 2006. A couple of shots of Convair 580 ZK-CIF at Auckland - above on 24 November 2005 and below a stunning sunset shot on 29 November 2005. A father and son operation. Air Chathams founder, Craig Emeny and his son Dwayne on 26 June 2006. Following the collapse of Origin Pacific in 2006 the Metroliner returned to the Air Chathams fleet for use on charter work as well as back up for the Convair and during this time it was used to operate an extra Friday flight between Christchurch and the Chathams over the summer months. Back operating for Air Chathams but still in Origin colours, ZK-CIC, on finals for runway 02 at Christchurch on 7 December 2007. In 2008 Air Chathams established Chathams Pacific which operate domestic services in Tonga until 2013. Convairs ZK-CIE and ZK-CIF were the mainstay of the Tongan operation but the combi ZK-CIB was also used at times. The Convairs were also chartered to operate flights within Fiji and regional flights from Fiji. As well as the Convairs the Metroliner ZK-CIC was also deployed to Tonga. Smaller aircraft were acquired to operate services to 'Eua and the Niuas. The airport on Chatham was government-planned around 1980 on the assumption that the so-called "Norfolk island" Friendships of Air New Zealand would operate the service. These Friendships were configured and equipped for the oceanic sector and fuel loads required. 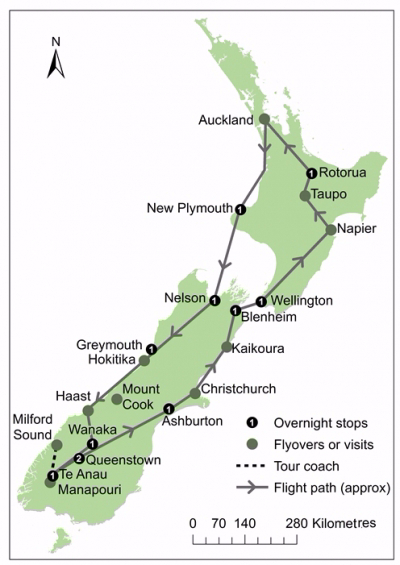 Air New Zealand, however, had no interest in flying to the Chathams. 25 years on the runway imposed limitations on the Convair flights and so engine modifications were made to ZK-CIB which allowed for greater fuel and freight-laden take-offs on flights from the Chatham Islands. These modifications also enabled flights to Napier to be were reintroduced. Napier had been cut from the schedule in 1996 because the runway length at Hawke's Bay Airport was too short for the company's Convairs in high temperature conditions with full payloads. The new service to Napier began on the 4th of October 2007. The Convair flew from the Chathams to Auckland and then landed at Napier on the return flight which operated each Thursday. As the Chathams were part of the Hawkes Bay District Health Board it was hoped that the service would generate sufficient traffic. These hopes never eventuated and there was a consistently low volume of passenger and freight traffic through Napier. In the end the airline felt it could no longer sustain the Napier stopover and it was withdrawn as an Air Chathams port on the 26th of April 2012. A growing area of work for Air Chathams during the summer months was charter flights for Tauck Tours which Air Chathams took over from Pionair. This American travel company was started by Arthur Tauck when he started Tauck Motor Tours in 1925 and today it offers tours around the world. Convairs ZK-CIE and ZK-CIF were both used for the Tauck charters. 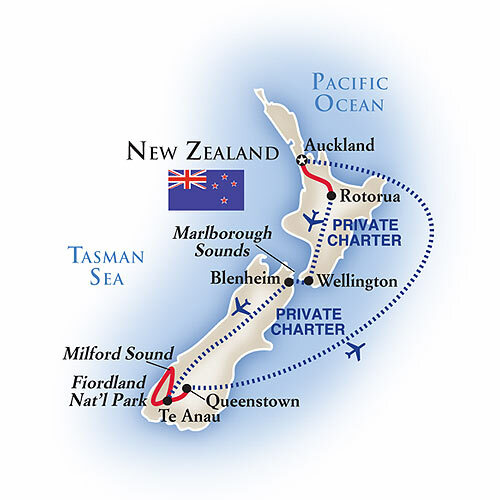 The Tauck Tours contract ended in 2014 but Air Chathams continues to offer other air tours for other travel companies as well as a comprehensive charter service. In 2013 Tongan government set up another airline in Tonga to provide competition. This was helped by the Chinese government's gift of a Xian MA60 and a Harbin Y12. Rather than compete in a limited market Air Chathams made the decision to withdraw its Chathams Pacific operation. The new airline, Real Tonga, leased a number of Chathams Pacific aircraft in its establishment. Subsequently Douglas DC-3 A3-AWP/ZK-AWP returned to New Zealand on the 23rd of December 2013, Metroliner ZK-CIC on the 6th of February 2014 and BN Islander A3-LYP/ZK-LYP on the 5th of March 2014. A couple of days after arriving back in New Zealand Britten Norman BN2A-27 Islander ZK-LYP (c/n 821) flew from Auckland to the Chathams to cover for the Pitt Island service while the Cessna 206 which was having its engine changed. As the main summer tourist season was coming to an end the Islander was used for only a few flights in early 2014 but even in that brief time it proved very popular with the locals. It flew back to Auckland in August 2014 and was chartered by Great Barrier Airlines for a time before being sold in Australia in October 2015 becoming VH-TRS. Like the BN Islander, the Metroliner, ZK-CIC found little work in New Zealand after its return from Tonga. This changed on the 28th of April 2015 when Air New Zealand withdrew its services to Whakatane. 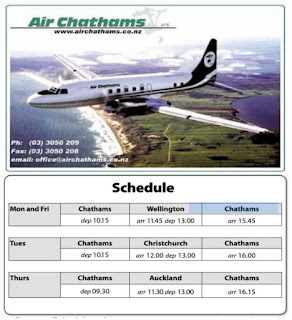 Air Chathams took over the service the same day. The first couple of weeks the service was operated using Convairs but the Metroliner has proved a better fit for Whakatane and now ZK-CIC is the mainstay of the Whakatane service. 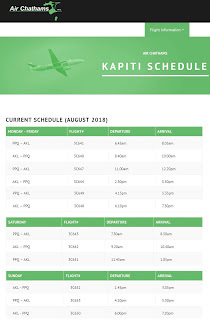 Initially two flights were operated each weekday with a reduced weekend schedule but from the 27th of July 2015 the weekday schedule was increased to three flights a day. 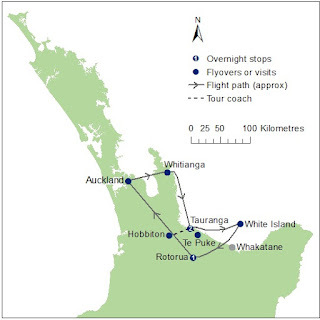 From Labour Weekend 2015 the Whakatane service was further enhanced with the introduction of a weekly Douglas DC-3 scheduled boutique summer service from Auckland. Douglas DC3C ZK-AWP (c/n 33135) was built in 1945 and at 70 years old she offers a sedate flight to and from the Eastern Bay of Plenty. The Dakota flies down to Whakatane late on a Saturday afternoon and returns at lunch time on a Sunday. The DC-3 summer service was offered again over the 2016/2017 summer. Above, Douglas DC-3 ZK-AWP finishes her engine run ups at Whakatane prior to flying to Auckland on 8 November 2015. Below, AWP shows off her new titling as she taxis at Auckland for her afternoon flight to Whakatane on 19 December 2015. The Whakatane service got further promotion in December 2015 when Air Chathams rebranded its Metroliner in a Whakatane colour scheme. Meanwhile the air services from Chatham to Pitt and to New Zealand that Craig Emeny established continue to do grow. Where in 1985 his Cessna 337 made the flight as freight dictated now the airline flies four scheduled Convair flights a week between Chatham and the mainland during the winter months and six flights a week over the summer months. During this time Air Chathams have been a major player in developing tourism on the Chathams with a growing number of New Zealanders wanting to visit this interesting group of islands. Tourists often avail themselves the opportunity to avail themselves of the service to Pitt Island which continues to be an important link to the Pitt Islanders. It is run on demand but over the summer and the crayfish season there can be several flights each day. 2016 saw the addition of three additional aircraft. An Aero Commander 690A, ZK-PVB (c/n 11321), was added to the fleet in late February 2016. To date the aircraft has not been assigned for any specific work. Aero Commander 690 ZK-PVB on the Chathams on 14 May 2016. In April 2016 Air Chathams acquired a second Fairchild SA227-AC Metroliner, ZK-NSS. This was reregistered as ZK-CID (c/n AC692B) and painted in Air Chathams colours. Air Chathams commenced their Whanganui to Auckland service on the 1st of August 2016. Saab 340A ZK-KRA operated flight CV701 under the command of Captain Tom Dunn and First Officer Adam Baker with Flight Attendant Violet Gordon-Glassford in the cabin. 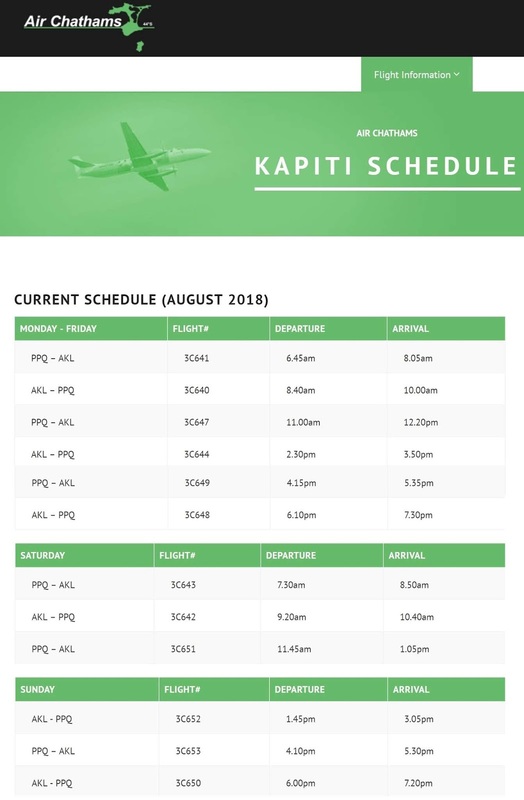 Air Chathams is operating three return weekday flights between the two centres, two northbound and one southbound services on Saturdays and one northbound and two southbound services on Sundays. 2016 also saw Air Chathams paint the all white Convairs, ZK-CIE and ZK-CIF in full Air Chathams' colours. 2016 ended with the addition of another Convair to the fleet in late November. ZK-KFL was purchased from Air Freight (NZ) and retained its all freight configuration. It was immediately put to work flying fish from the Chathams to New Zealand. In 2017 Air Chathams purchase Air Freight (NZ)'s three remaining Convair 580's ZK-FTA, KFH and KFJ with the intention that they be primarily be parted out. ZK-KFH was saved from this fate and has been used on Air Chathams' night freight operations. Delivering its first load of fish to Wellington, Convair ZK-KFL on 1 December 2016. It is seen below at Auckland on 3 September 2017. Convair 580 ZK-KFH at Auckland on 10 September 2017. Below, the two pure freighters at Auckland on 10 September 2017. With the introduction of new runway end safety area (RESA) regulations in 2017 Air Chathams DC-3 was prohibited from operating scheduled services to Whakatane. Charter or scenic flights are not effected and during the 2017/18 summer the DC-3 is being used for charter work and scenic flying from Tauranga and occasionally Whakatane and Whanganui. In October 2017 Air Chathams purchased the two ex-Airwork Fairchild SA227-CC Metro 23s, ZK-POE (c/n CC-843B) and ZK-POF (c/n CC-844B). The Metro 23 provides better systems, more power and a further increase in takeoff weight. Over the 2017/18 summer Air Chathams' based Convair ZK-KFL on the Chathams providing freight support for seafood exports on the Chathams over the busy summer season. It will return to Auckland in 2018 and the company is looking forward to continue supporting Freightways where requested. Air Chathams' Convair 580 ZK-KFL painted with a “Hopo” or “Toroa”, a Chatham Islands Albatross by Mr G... Graham 'Mr G' Hoete is a street artist from the Bay of Plenty who specialises in photorealism... ZK-KFL is a dedicated freighter that Air Chathams use on freight services in New Zealand and out to the Chathams. Photo taken on 18 January 2019. Metro 23 ZK-POF entered airline service in January 2018 supporting the company's passenger and charter services. On the 9th of January 2018 Air Chathams took delivery of the first of two further Saab 340 aircraft to be added to their fleet. How these aircraft are to be deployed is yet to be announced. In January 2018 Air Chathams took delivery of an A and B model Saab 340. These were imported from Guam. The A model, Saab-Scania SAAB SF340A c/n 340A-135, has been registered ZK-CIY and the B model, Saab Aircraft AB SAAB 340B c/n 340B-357, ZK-CIZ. Saab 340B ZK-CIZ entered service on Saturday the 7th of April 2018. Its first flights were on Air Chathams flight 3C 702 from Auckland to Whanganui and the return flight 3C 711. On the 2nd of July 2018 Air Chathams announced that it would commence flights between Paraparaumu's Kāpiti Airport and Wellington replacing Air New Zealand's service that ended on the 2nd of April 2018. The new air service began on the 20th of August 2018. Flight 3C 641 from Papaparaumu's Kāpiti Coast Airport to Auckland was flown under the command of Captains Craig Emeny and Duane Emeny with Etevihe Sakaria the flight attendant looking after the passengers. The inaugural service was operated by Air Chathams Saab 340B ZK-CIZ. After three months more than 13,000 people had flown in and out of Kāpiti with Air Chathams. The early morning service to Auckland and return evening service to Paraparaumu proved to be the most popular flights are were often full. From the 21st of November 2018 Air Chathams replaced the Saabs with Metroliners on the morning flight, 3C 640 to Paraparaumu, and the 9.30am return flight, 3C 647 to Auckland. Repainted and with new script, Air Chathams' Convair 580 ZK-CIB departs Wellington for the Chatham Islands on 26 July 2017. On the 19th of May 2018 Air Chatham's Convair 580 ZK-CIE flew a charter flight to Norfolk Island for a music festival as CHATHAMS 581. 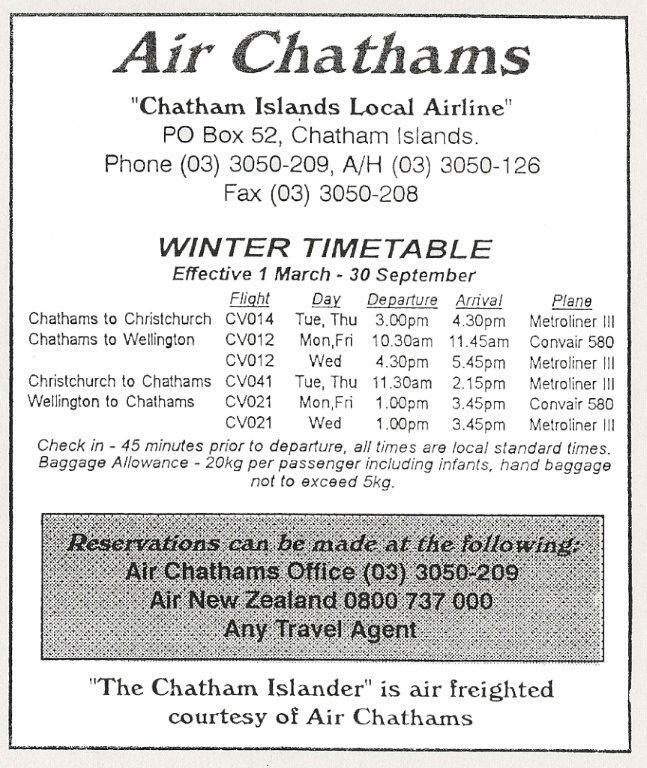 This was the first time Air Chathams' had operated international flight. This was followed by some freighter flights. On the 25th of October 2018 Air Chathams began a series of charter flights that had been arranged by Pukekohe Travel which, for a number of years, has offered tours to the Chatham Islands in conjunction with Air Chathams. The flight was operated in Convair 580 ZK-CIE operating as CHATHAMS 401 to Norfolk and CHATHAMS 402 on the return. 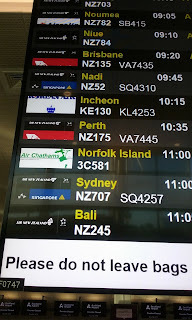 Since then a number of flights have operated to Norfolk Island. Meanwhile Air Chathams is planning to operate a regular service to Norfolk Island from September 2019. 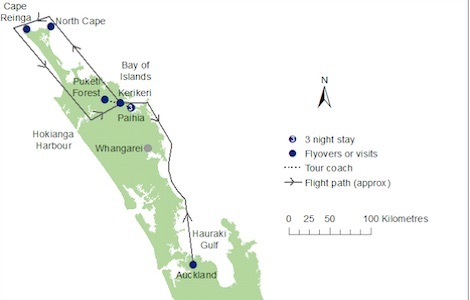 At the end of 2019 Air Chathams reduced their frequency of flights to the Kāpiti Coast. Cut from the schedule was the morning flight from Auckland and late morning flight back to Auckland. Air Chathams' Duane Emeny said that these "flight timings not previously offered by Air New Zealand and the uptake has been poor so they will be discontinued and are no longer available for booking." The last operation of flight 3C640 from Auckland to Kapiti Coast and flight 3C647 Kapiti Coast to Auckland was on the 24th of December 2018. As for the future the big question for aviation enthusiasts is what will eventually be the replacement for the Convair. The Boeing 737-400 and the ATR 72 seem to the most rumoured replacement. The Boeing would require a runway extension on the Chathams and there are no plans to acquire ATRs so in the meantime we can continue to enjoy the mighty Convair as the best fit for the Chatham Islands. With Air Chathams flying Convairs and a DC-3 it is becoming a magnet for aviation enthusiasts from around the world. While a decision has not been taken on a Convair replacement Air Chathams' took delivery of an ATR 72-500 in January 2019. ZK-MCO was acquired from Air New Zealand operator Mount Cook Airlines and is being used for tourist flights around New Zealand for American company, Tauck Tours. The ATR entered service on the 8th of February 2019 positioning from Auckland to Wellington as CVA272 (Chathams 272) and then flying a Wellington-Blenheim Tauck Tours' flight as CVA273 (Chathams 273). The air service component of Tauck Tour's New Zealand tours start in Wellington and from there fly to Blenheim and on to Te Anau. The tourists are finally flown from Queenstown to Auckland. Wherever Air Chathams have operated it has established itself as an airline for the community. One wonders what communities it will serve next as it quietly and confidently moves onwards and upwards.